As a high school student, Jaylon Thompson ’17 was focused on becoming a Georgia Bulldog. As a high school student, Jaylon Thompson ’17 was focused on achieving his dream of becoming a Georgia Bulldog; even his sleep schedule was disrupted by the “pure excitement” he felt when envisioning life at the University of Georgia and its renowned Grady College of Journalism and Mass Communication. 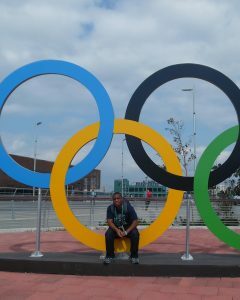 Little did Jaylon know, but his experiences at UGA would one day take him to the Olympics. When Jaylon set his sights on attending UGA, he focused on his schoolwork and graduated as valedictorian of his high school class. Scholarship support gave him the financial means to turn his aspirations into reality. Along with the Hope and Zell Miller scholarships, Jaylon received the One UGA Scholarship, which is awarded to academically strong students who contribute to diversity on campus. The One UGA Scholarship is funded, in part, by donors who make unrestricted gifts to UGA. 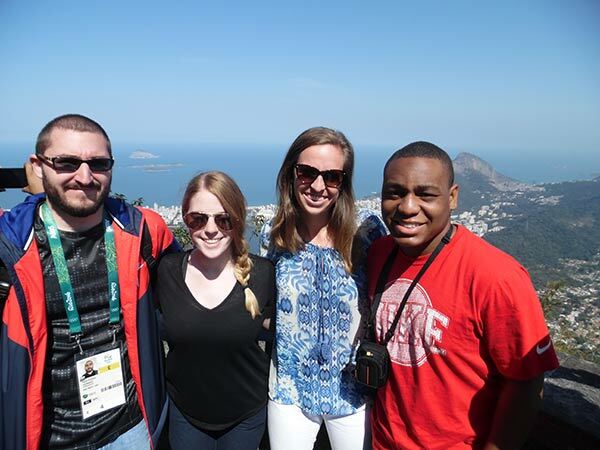 In 2016, Jaylon was chosen through a rigorous application process to cover the Summer Olympics in Rio de Janeiro for the U.S. Olympic Committee website, TeamUSA.org. Not only did Jaylon meet athletes he’d admired for years, like Michael Phelps, Simone Biles, and Usain Bolt, but this achievement solidified his promising career as a sports journalist. Scholarship support attracts students like Jaylon to UGA and helps them dive into campus activities that enhance their classroom learning. Jaylon leveraged his UGA career to help himself and others be better prepared for the future. The digital and broadcast journalism major’s resume reads like that of a seasoned journalist. As a writer for The Red & Black, UGA’s student-run newspaper, he covers the sports beat and writes features that illuminate the art in student-athletes’ sportsmanship and commitment to their teams. In 2015, Jaylon interned with the Houston Chronicle and secured a front-page article about the 2015 Women’s World Cup. In 2016, he interned with his hometown newspaper, The Atlanta Journal Constitution, covering the Atlanta Braves and Falcons. On top of his impressive internship experiences, Jaylon is a leader on campus and seeks to help his peers achieve their goals, too. As co-editor-in-chief of E.L.I.T.E., a student-run online storytelling platform, Jaylon promotes peer-to-peer dialogue and opportunities for constructive feedback and positive encouragement on contributors’ writing projects. He also serves as the executive outreach chair for the UGA Chapter of National Association of Black Journalists, and was chosen as a McGill Fellow, a fellowship awarded to Grady College students who exemplify excellence in academics and leadership. Update: Jaylon accepted a position as a multimedia and sports journalist at MLB Advanced Media in May 2017.